The Auburn Athletic Department announced today that they have scheduled home-and-home games against Xavier beginning this season in Auburn Arena. "Xavier has been a consistent top 25 program," Pearl said in a release. "They are talented and play an attractive style. Our fans will appreciate watching them." A member of the Big East Conference, Xavier went 21-13 last year (10-8 Big East), which led to their eighth NCAA Tournament appearance in the last nine seasons. And since 2004, Xavier has made two Elite Eight appearances in the tournament, as well as three Sweet 16 appearances. In the all-time series between the two schools, Auburn trails 4-3 with Xavier winning the last four matchups ('71, '72, Jan. '08, Dec. '08). This season's matchup will be just the second time the two squads play in Auburn. Less than a week after classes were cancelled due to a threat posted on a bathroom wall on campus, Auburn University has reported a bomb threat on campus. The school has evacuated the Haley Center, the target building for the threat, as a result. It's unclear how the threat emerged, but rumors are circulating that a student reported the threat originally to university officials. Bomb squads have made their way on campus as seen in the gallery of images below. At the corner of College and Magnolia, fences have been placed around the Toomer's Corner site, as renovation has begun this week. The fences contain images of old and new. Vintage pictures of the previous oaks are featured on one side, while new post-renovation depictions are shown on the other. 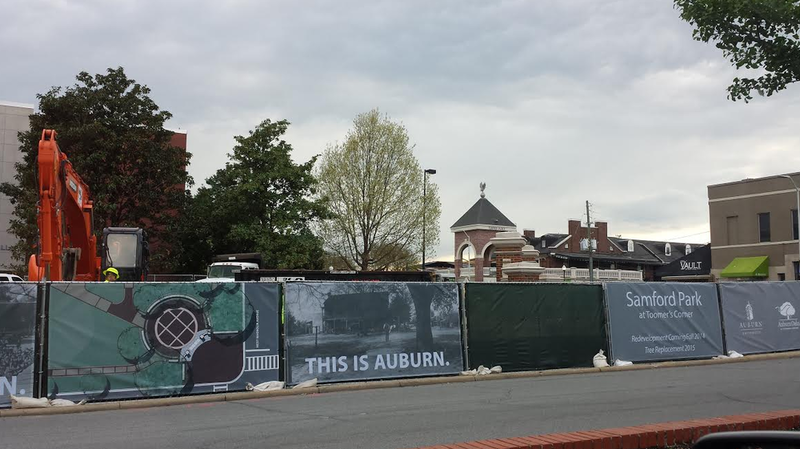 Courtesy of thewareaglereader.com, here are some street-view images of the fences. Just six days after the firing of former head basketball coach Tony Barbee, Auburn AD Jay Jacobs has hired former Tennessee head coach/ESPN analyst, Bruce Pearl. Pearl, a proven head coach in the SEC with an all-time record of 145-61 as well as six NCAA tournament appearances during his six seasons at Tennessee, will replace Barbee whose 49-75 record at Auburn with zero NCAA tournament appearances couldn't meet Jay Jacob's standards for the basketball program. In 2011, the NCAA forced Pearl out of Knoxville, as well as being handed a show-cause order through August 23 of this year after lying to NCAA investigators about his contact with certain recruits. "From the moment I met Coach Pearl and heard his vision for our basketball program, it was clear he's the right man at the right time for Auburn," Auburn AD Jay Jacobs said in a statement. "Coach Pearl is a proven winner who will bring energy and excitement to our program. We have raised the bar for Auburn basketball, and I could not be more excited for our student-athletes and our future under Coach Pearl's leadership. I know he agrees with me -- it's time to win." Less than an hour after the Tigers' loss against South Carolina in the first round of the SEC Basketball Tournament, Tony Barbee has been fired from his position of Auburn head coach. Coming off of a dissapointing 74-56 loss against the Gamecocks, Jay Jacobs decided to finally pull the plug on the Barbee era at Auburn. "After careful evaluation of the last four years, I feel this is best for the program," Jacobs said in a statement. "I believe we should compete for championships in men's basketball. It's time for somebody else to have a turn. We need to find somebody to come in here and take what we have here now and put some more in and compete for SEC titles." So with that news officially out, who should the Tigers look towards for the future of the basketball program? Possibly Toledo's Tod Kowalczyk, or maybe former Tennessee coach Bruce Pearl? Auburn certainly isn't a top-notch basketball program, but with all of the money invested in recent years, the Tigers should have some better pickings than in 2010. The Auburn Tigers, sitting with a 12-12 record overall (4-9 in SEC), will be taking on the Vanderbilt Commodores (6-7 in SEC) today in Auburn Arena. Vanderbilt and Auburn come in at the 10th and 11th places in the SEC conference, respectively, for today's matchup. After suffering a tough, nail-biter loss against #2 Florida last Wednesday, the Tigers look to rebound against a Commodore team consisting of just seven-scholarship players. With five games left in the regular season, it's time to finish strong. Auburn wins the opening tipoff and is awarded the first foul shots of the game. Auburn up 2-0 with 19:41 remaining in the first half. Vanderbilt is suffering from sloppy play and poor shooting, which results in an early 9-0 lead for Auburn after a three-point play from Chris Denson. Vanderbilt finally gets on the board with a 2, but Auburn quickly responds with a three-pointer to extend their lead, 12-4. Great offensive possession by the Tigers which consisted of two offensive rebounds to extend their lead, 18-9. We enter our first TV timeout with Auburn leading, 18-11. After a three-pointer by K.T. Harrell, the Tigers extend their lead in this game, 24-11. Absolutely dominating the Commodores thus far. An unreal looking layup by Chris Denson brings the Tigers' lead to 16. Auburn up 29-13. Chris Denson ends Vanderbilt's 6-0 run, as he hits one of his two foul shots to give Auburn a 30-19 lead. Auburn calls a timeout after Vanderbilt cuts the lead to seven, 30-23. The Commodores are on a 10-1 run. Vanderbilt finished strong, as they cut what was once a 16-point lead down to 7. Auburn leads 32-25 at halftime from Auburn Arena. Vanderbilt with a huge comeback, as they cut Auburn's lead to just one after a huge three-pointer. Auburn up 38-37. And right as I type that last update, Vanderbilt hits yet another three to take the lead for the first time this game, 40-38. Coach Barbee calls a timeout for Auburn. Already four three-pointers this half for the Commodores, but Auburn finally responds to cut Vanderbilt's lead to three, 43-40. Unbelievable. After seven straight points by Tahj Shamsid-Deen, Auburn has tied the game up at 47. Vanderbilt is making it rain three's in the second half, as they extend their lead, 58-50. Looking bad for Auburn. A HUGE three by K.T. Harrell cuts Vanderbilt's lead to three, 58-55. Every time it seems like Auburn is cutting a corner for a comeback, Vandy ends up pulling away once again. Vanderbilt leads 63-57. 10, yes TEN three-pointers for the Commodores in the second half alone. To make a comparison, Auburn has only connected on four three's all game. Unbelievable. I've never seen anything like it. Commodores lead 66-57. Auburn is throwing up some pretty silly shot attempts as the Commodores still hold a 66-57 lead. Auburn falls to Vanderbilt 67-59 after one of the worst second-half performances I have ever seen. Tony Barbee's seat is awfully hot right now. "Auburn's annual spring football game, A-Day, on Saturday, April 19 will kick off at 2 p.m. CT and be televised live by ESPN. A-Day will provide fans a sneak peek of the 2014 squad and will also honor the 2013 SEC Champions. Tickets for A-Day are now on sale online at AuburnTigers.com. Fans can conveniently purchase tickets from home and avoid waiting in line on A-Day. Stadium seating for A-Day will be general admission and tickets are priced at $5 each." The countdown to the start of the 2014 football season begins! 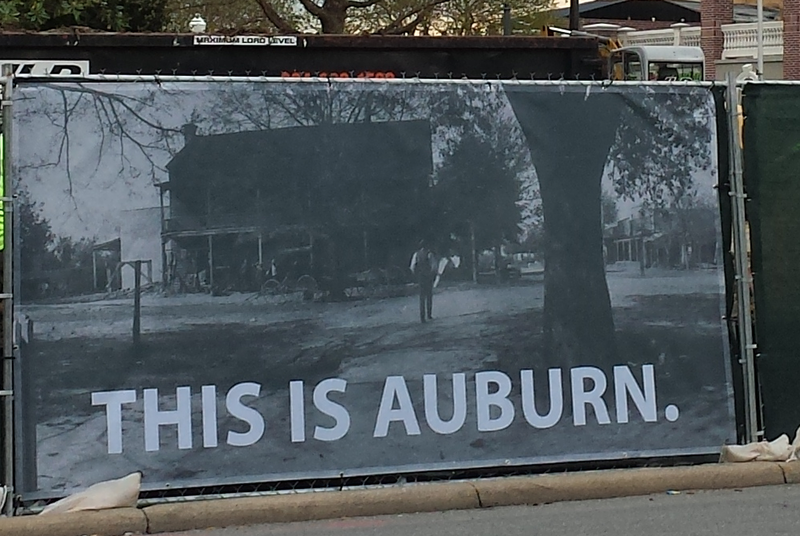 The Auburn family will have to roll the tree-less wires at Toomer's Corner for just one more year. The university announced today that they will be renovating the Toomer's Corner area, located on the corner of College and Magnolia street, to include more open space for foot and vehicular traffic, as well as replacing the two oak trees that were poisoned in 2011 by outspoken Alabama fan, Harvey Updyke. The first phase of the project will come in the spring when Auburn officials will replace the poisoned soil at the former oaks' sites, along with the addition of a new seating wall to allow more visitors to soak in the experience during celebrations. Phase I of the project will cost $900,000 to be completed. "We think the Auburn family will like the look of the corner," said Dan King, assistant vice president for facilities management at Auburn. "It is not a radical change, but it will open things up and allow more people to enjoy it." Below is a photo gallery of various models that the university has released to the public. Just a few days removed from National Signing Day, one of Auburn's top defensive back signees, Kalvaraz Bessent out of Kingsland (GA), might have found himself in a bit of hot water today. Bessent's name was found in a Florida criminal database today (seen below). According to the database, Bessent was arrested on February 8th, and later released on "General release". Bessent, as you may recall, was a former Alabama verbal before flipping his commitment to the Tigers just days after the 2013 SEC Championship. After a quick google search of "Kalvaraz Nehmiah Bessent", his name is now associated with a website, justmugshots.com, which also features a video showing his booking photo and details surrounding his reported arrest. According to the same video, Bessent was arrested for "Possession of Marijuana" in Nassau County, Florida. There's a rumor circulating that there was also a weapon found at the scene, but there is no confirmation of that at this time. I'll continue to update as I hear more. UPDATE 2/8/14 - 6:34 pm: According to Al.com, Bessent was arrested on two felony charges from possession of marijuana and intent to sell. The high school senior was also charged with a misdemeanor for possession of drug paraphernalia. He was released on $5,506 bond. UPDATE 2/8/14 - 6:44 pm: According to James Crepea (@JamesCrepea), a spokesman told him that Gus Malzahn is "aware of the situation and is continuing to gather information". The Auburn coaching staff, regardless of Rashaan Evans' choice, was looking to add a second safety into the mix from the get-go. They got their wish on Monday when Markell Boston, a three-star safety out of Georgia, became the Tigers' 21st commitment of the 2014 recruiting class. Boston was previously committed to East Carolina, but the Auburn coaching staff liked what they saw in the 6-2, 200 pound safety, which resulted in an offer from Coach Malzahn. With the new offer, Boston de-committed from the Pirates and committed on the spot to the Tigers. With Boston's commitment, the Auburn coaching staff looks to be done recruiting safeties for this class, as it now looks like former Auburn target, Lamont Simmons, is headed to USC. Boston is the third safety commit for the Tigers' 2014 class. Among the fastest backs in his class with a 40-time of 4.35, Griffin plays running-back at his high school. But in Gus Malzahn's offensive scheme, he could find a role in the slot receiver position. His top three seem to be Georgia, Ohio State, and Oregon at the moment. Sized at 6-2, 205 lbs, Colbert will likely find himself playing linebacker in college. Auburn offered this Griffin athlete in January, so this visit could favor Auburn heavily. Right now he seems to favor Georgia and North Carolina. Visiting with his McEachern High School teammate, Taj Griffin, Edoga picked up an offer from Auburn last June. The 6-4, 280 pound junior currently has 25 offers to his name, and is favoring in-state Georgia and Oregon for his college choice. But Auburn doesn't seem to be far behind on his list. Another top-100 prospect out of Georgia, Patrick will be visiting Auburn for the third time this weekend. Look for Patrick to play defensive end in college. Georgia, Auburn, and Alabama are among his top choices. Queen is long-time Auburn commit (committed last July), and has actively been recruiting for Auburn ever since. It'd be a pretty big shock if he ended up being anything other than an Auburn Tiger at this point, but I've said it time and time again -- based on his build and skillset, I'm not sure how he's going to fit into Malzahn's system. A target for Auburn's "Star" position, Smith was offered by the Tigers' coaching staff in September. Kentucky, Auburn, Georgia, and Alabama all seem to be in the race for the junior from Georgia. A talented junior running-back from Georgia, Swinney will be visiting Auburn for the third time. His previous visit to the Plains was an unofficial for the Mississippi State game last September. Look out for Florida State, Auburn, Ole Miss, Georgia, and Tennessee during his recruitment process. The lone athlete from Louisiana, Thomas will be making his second trip to the Plains after visiting for Junior Day last year (offered during his visit). The junior tackle currently favors the in-state LSU Tigers. Based on the junior end's size (6-3, 210), Walker could play a vital role in Auburn's defense at either the outside-linebacker position or defensive end spot. Warmack will be visiting with his Mays High teammate, Natrez Patrick. Warmack is an early Alabama commit (committed last July), but Auburn is hoping to make a push for Warmack this weekend. Worth mentioning is that his brother, Chance Warmack, played for the Crimson Tide from 2009-2012. The Auburn coaching staff seems to like Wilkerson and his fit for Gus' offensive scheme. Most are expecting Wilkerson to receive that Auburn offer soon, so keep an eye on that with a commitment to go along with it. Son of former Auburn running-back, Stephen Jackson, the sophomore athlete is no stranger to Auburn or its coaching staff. Malzahn and his staff like Jackson at the safety position. Danielle Downey, the director of golf operations, died in a car accident on Thursday night in Lee County. Downey, 33, was pronounced dead by Lee Counter coroner, Bill Harris, at 10:58 p.m. last night. It's not known as of now if icy conditions were the cause of the accident. Downey was not only an Auburn coach, but also an Auburn alumna as she played golf at Auburn from 1999 to 2003. During her playing career at Auburn, Downey received All-American honors in 2000, 2002, and 2003, as well as receiving All-SEC honors for all four years. Following her career at Auburn, Downey continued her golf career as she played on the LPGA and Futures Tours. Downey stepped in for women's coach, Kim Evans, after she was diagnosed with ovarian cancer last season. Auburn's golf program finished sixth in the NCAA tournament last season under Downey. "I'm absolutely devastated," Evans said in a statement. "Danielle meant so much to me, the girls and this program. Not only did she give much of her life to Auburn as a student-athlete and as mentor to these young women, but she was so instrumental to this team during some tough times over the past year. Danielle was like a daughter to me." "This is a tragic and devastating loss for Danielle's family, our student-athletes and staff and the entire Auburn family," Athletic Director Jay Jacobs said. "Danielle cared deeply about people and she was loved by all who knew her. She impacted a lot of lives here as a player and a member of our staff. Our hearts go out to Danielle's mother and father, her sisters and all who knew and loved her. She will be dearly missed." The No. 1 target for the Auburn coaching staff at this point. Auburn seems to be a pretty heavy favorite in his recruitment, as he's expected to announce on signing day. It'll come down to the wire with Alabama and UCLA, but a good visit this weekend could provide Evans with the confirmation he's looking for. Although he claims his commitment to South Carolina is a solid one, a visit this weekend will open up a new door of opportunities for the Auburn coaching staff as they'll try to make a late push for Davidson. Treon will be making his first trip to the Plains this weekend. The Auburn coaching staff will certainly take this one down to the wire, as they'll offer Harris the opportunity to play a versatile role in Auburn's offense during his college career. Dominick took an official visit to UCF last weekend where he ended up committing to the Knights. Auburn has yet to offer the 6 foot, 185 lbs safety, so Auburn could make a late push for Sanders down the stretch. An offer from the SEC champions would be awfully hard to pass up. Also visiting this weekend are a group of Auburn commits who will continue to assist in the other visitors' recruiting processes. Although the Tigers missed out on Shaun Dion Hamilton earlier in the year, Auburn has picked up a better linebacker in Tre Williams. Recruited by Dameyune Craig, Williams attacks and is relentless in his pursuit to the ball carrier, as he explodes into the backfield to disrupt offenses. Williams will play a vital role in the Tigers' defense in 2014, as middle linebackers are a crucial need for Auburn at this point. Although small (coming in at 6-feet, 180), Roberts will provide a much needed boost to the Auburn secondary, most likely at the safety position for the Tigers. Roberts has the closing speed to catch nearly anyone in the SEC, as he is swift and light on his feet in his efforts to swarm ball carriers. I wouldn't be surprised to see him get some playing time as a return specialist during his career at Auburn as well. The "golden child" of Auburn's 2014 recruiting class, Roc Thomas is a versatile back that will work wonders in Malzahn's system. Roc's strongpoints come with his quick cuts, shiftiness, and the ability to make defender's miss as he breaks into open space. Roc sat out for the Alabama-Mississippi Game with an ankle injury he suffered during practices, but Thomas says he's now back to 100% and has practiced full-speed all week. 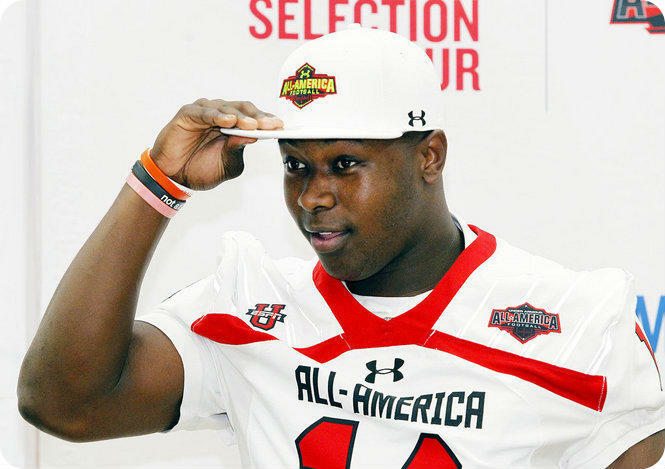 The newest addition to Auburn's 2014 class, Russell made the flip from UGA to Auburn last week. Russell could use a bit of work and conditioning, as he's very raw right now at the tackle position. Extremely explosive off the ball, Russell will only add to Auburn's young defensive line in the next few years. White is one of the underrated additions to Auburn's class, as he fits Malzahn's system pretty well. The 6-2, 204 pound quarterback shows great mobility within the pocket, as he has the ability to extend plays with his feet (40 time of 5.05), while also displaying pinpoint accuracy. Interceptions are a rare sight for White (5 in his senior year), so when he misses, it usually won't fall in the hands of defenders. 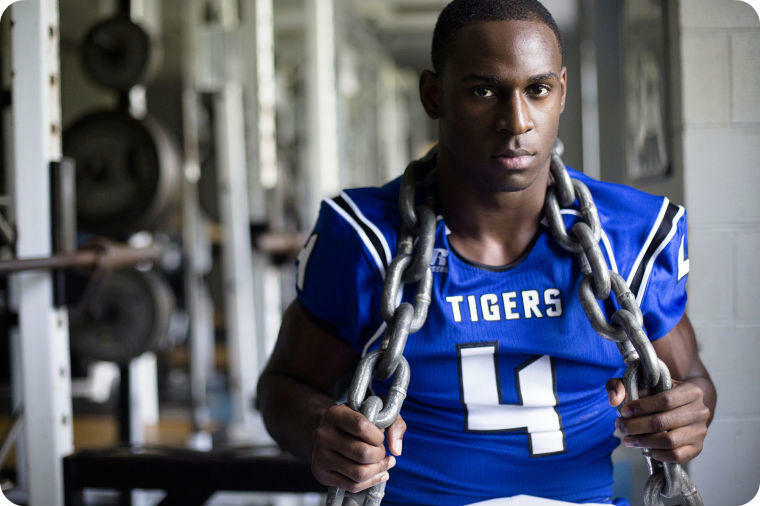 After attending this year's Iron Bowl, Bessent flipped his commitment from the Tide to the Tigers. Bessent has the footwork and mobility to become a real playmaker in the SEC, but his technical game doesn't seem to be completely there just yet. With a bit of coaching, however, the corner has the ability to quickly figure out his assignments on the field. Also keep an eye on Bessent's weight, as Coach Russell will have his work cut out for him to get the 6-0, 170 pound corner in SEC shape for the 2014 season. After receiving the commitment of ILB Tre Williams, the Auburn coaching staff would love to receive one from the hometown kid, Evans, in the near future. Making the transfer from end to linebacker, Evans' transition has been smooth, as his 4.51 speed along with his tremendous strength will allow him to see some solid playing time in 2014, regardless of his college choice. A long-shot for the Auburn coaching staff, Rudolph possesses the ideal receiver size (6-1, 185 lbs) as well as his superb route-running ability to create space from defenders. Florida State has made a recent run at Rudolph, and is now considered to be the favorite, along with Alabama and Florida. Another player to keep on the radar today will be the four-star, offensive guard from Kansas. Smith has been practicing across from #1 recruit, DE Da'Shawn Hand this week, and has impressed many scouts at practice. Smith has also expressed interest in playing tackle in college, but work is to be done on that front if he wants to make his wish a reality. TCU is considered to be the favorite for Braden Smith at this point. Ricky Parks, the former 4-star athlete out of Callaway High School in Georgia, will be returning to play football at Auburn next season, after being dismissed for a violation of team rules at the start of fall practice. The 6-4, 263 pound sophomore will likely resume his role at tight end, as Coach Malzahn has given Ricky the opportunity to walk-on at Auburn for the 2014 season. Parks will have to work his tail off to see the field next season, as he will be behind current juniors, Brandon Fulse and C.J. Uzomah, on the depth chart. The tight end will have three years to play three seasons as an Auburn Tiger.